For months I’ve been hearing about a “Super El-Nino” that’s supposed to bring unprecedented rain to Southern California. Our weather has certainly been unusual, but disappointingly lacking in precipitation. The few showers we did get, came in with warm humid fronts. Last week, we got our first winter storm with cold temperatures, and the local mountains got their first coating of snow. It wasn’t much, but hopefully, there will be a lot more to look forward to in the near future. 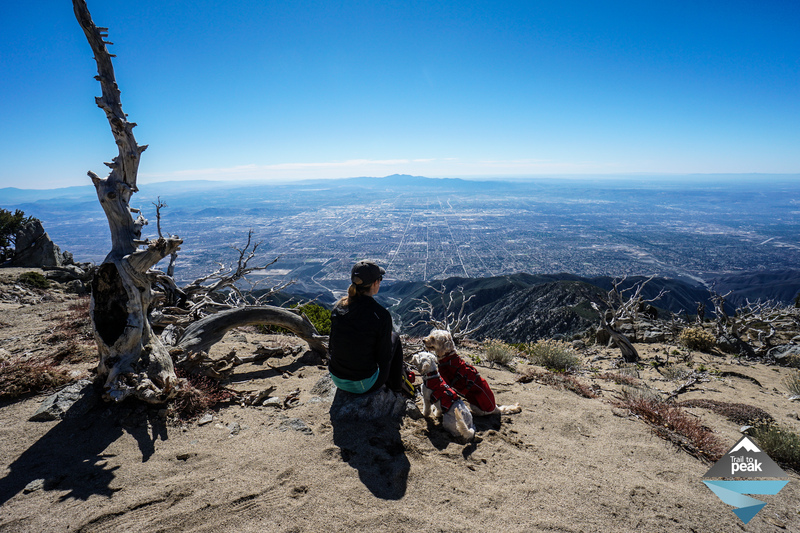 This weekend, I took Julia, Isla, and Lilly up to our favorite mountain, Cucamonga Peak, for a little bit of fun in the snow. This hike covered 12 miles with nearly 4000 ft of elevation gain. We started early to get a jump on the seasonally shortened days, and were greeted with the unmistakable bite of a cold mountain breeze. The first few miles on the Icehouse Canyon Trail were already flowing with weekend hikers, and to Isla and Lilly’s delight, we passed 6 other dogs. Just as we approached the Icehouse Saddle, we began to see small patches of accumulated snow. This was a welcome site, as we had only passed 7500 ft of elevation. After the Icehouse Saddle, we continued on towards Cucamonga Peak. Snow was still clinging to all of the North facing slopes here, but all of the South and Southwest facing slopes were bone dry. This is usually the case year-round up here, which makes for some really fun hiking. The small amount of snow on the trial was still crunchy and offered lots of grip. Microspikes are not necessary yet, but will be soon. We made it to the top just as the sun was climbing towards noon in the sky. Isla and Lilly sprinted around at the peak, as usual, before settling down for some snacks and water. We made our way over to Pride Rock to take some obligatory pictures with the Inland Empire before heading down. There was a large group of hikers taking what seemed like 100 shots up there. While were were waiting , I took some shots of Isla and Lilly on surrounding rocks, and took some time to soak up the beautiful views. It’s was a day of stunning clarity. Wow! Incredible views! Thank you for sharing. I hiked up to Icehouse Saddle few years ago but never went to Cucamonga Peak. It sure looks like a great hike but I am not sure if Xena can do the whole thing. Is there a shorter option for Cucamonga Peak? It’s a longer hike at 12 miles, but definitely doable for most dogs. Unfortunately, this is the easiest route. There is a longer more level route in Icehouse Canyon via Chapman Creek. The route from Lytle Creek to the Saddle adds another 4 miles round trip.